A Dustland Fairytale (by ASR) | escaped. Warning: This is a very long, lovey-dovey post. You’ve been warned. So today is our first anniversary of being married. And I’m stuck here in Kansai Airport all by myself waiting to check in to the hotel. What a great way to spend your first anniversary. Whoa time sure flies so fast. You sure tend to notice things when you’ve reached a certain milestone. I promised the wife to write something here every once in a while (once a year to be exact) and God knows how long it has been since I last wrote here. I’m a very slow writer, I’d even take an hour just to post something on Facebook. And so I just gave up. What’s the point in venting your feeling for the world to see? See when you got married you have your partners to do that haha. I’ve never told my side of the story for our wedding. I’m sure you’ve all read my wife’s entries on them down to the tiniest details (they never forget about these things..), even to where the mak andam got her makeup set or something.. I guess it’s true when they said that a woman dreams of getting married since she's 12. We men just dream of getting married to the perfect girl. A week before we’re going to get married I had a food poisoning. The first day was bad, but then it gets better but I was still uncomfortable. I tried to eat less as I’d end up going to the toilet minutes later. This went on for a couple of days until I succumbed and went to see a doctor. The result: ‘You’re fine, there’s nothing wrong with you’. This was 3 days before the big day. And then it hits me, I didn’t know that cold feet could extend to irregular bowel syndrome. I do get jitters before a big exam or an interview but this was a whole new level for me. 2 days before the big day I went back to my hometown. Took a cab to the airport. Flight was at 8pm. Left office in PJ at 530. Yes I was still naive back then about traffic in the Klang Valley. I only arrived at the airport 15 minutes past 7, I ran for my life to the counter. In the cab I was frantically practicing my lines for the counter lady in my head, ‘Tolong kak saya nak kahwin esok ni!’. Luckily my gelabahness was all for nothing as there’s still time because the flight was delayed, pftt.. So the big day came, I got all my close families around me. Took a nap in the afternoon, and by evening the jitters started to come again. My families kept scaring me about how the Tok Kadi would test you to recite certain doas and surahs. So me being the most lovable uncle I asked my nieces to recite them of course, just to remind me again haha. The akad nikah went on smoothly. Again my gelabahness was all for nothing, the Tok Kadi just went on with his job and didn’t test me on anything thank god.. I’m a fairly simple man so for my ring I just used the ring that we got together while in Japan. I always wear it on my left hand so imagine the horror when I knew that it should be on your right hand.. It didn’t fit! After enough pushing and shoving I did manage to wear it, albeit painfully though. Fast forward one year on, and now we have a kid! And life has never been better. Of course we had our fights, but then we make up and it’s all lovey-dovey again. 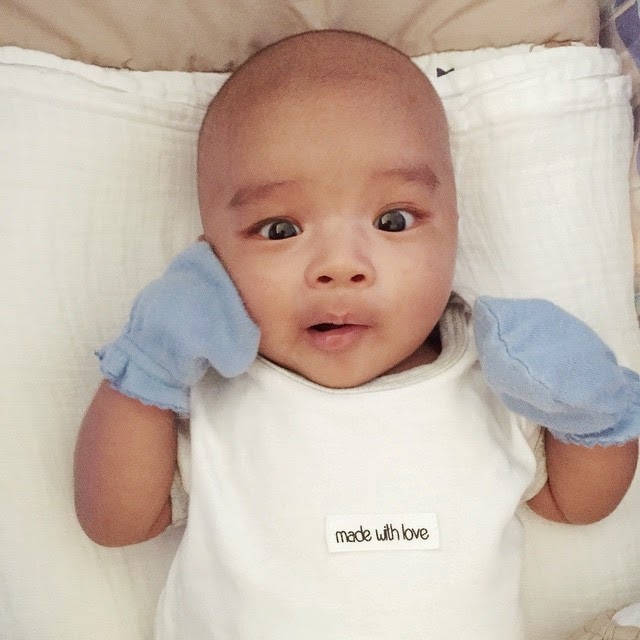 And Rayyan is just the cutest thing (which parent would not say that about their kids haha). At night after dinner we would fight about who’s going to hold him if he’s not napping or feeding. He’s the center of our world now, and even though we’re super exhausted once the day is over, seeing him smile would push the reset button again. And I want to thank you syg for making all of this possible. Thank you for always putting up with me when I complained a lot. Sorry I always played my songs in the car. I’m sorry that you have to make your curry less pekat, and your rice drier for me. Sorry when I’d make my face when you’re shopping. Thank you for temaning me watching football everytime (eventhough you kept mistaking LVG to Moyes or RVP to van der Sar). Thank you for temaning me watching GoT, the Walking Dead, and Justified (I did watch Full House tbf..). Sorry that I kept gassing you during labour. Sorry when I sometimes didn’t wake up when Rayyan’s awake. Sorry for not being there with you today. I’m sure glad that I married my best friend. I love you Sayang. P/S: FYI this 873 words long post (including the title and this footnote) took me a whole week to finish. I guess I the next one would come after our second child haha. such an innocent view from a guy, masya Allah you're lucky Zatil!